As Far as My Feet Will Carry Me , by Josef M. Bauer, Constable & Robinson 2003(1957), 275pp. Years ago my dad and I went upstairs at Shakespeare & Co. in Paris to look at Hemingway's library. Both fans of survival literature, we were pleased and not surprised to see that Ernie had also read The Long Walk by Slavomir Rawicz. This is the ripping yarn of six escapees from the Soviet gulag in Siberia, who walk south across the Gobi and the Himalayas to freedom in British India. Who cares if it was true: I still remember the stag with its horns caught in a tree; the hulky guy ice fishing by smashing a hole with a tree trunk and the fish popping out; eating snakes baked on Gobi stones; sighting a yeti; and the enigmatic CIA type (an "engineer") Mr Smith. So when I read that Josef Bauer had written a German equivalent about Clemens Forell, who escaped from the Eastern tip of Siberia and walked all the way to Persia, I snapped up a copy. Bauer's book is darker than Rawicz's, which is basically a romance, and has a team helping each other. At Cape Deschnev, the prisoners work, and live, in a lead mine, slowly being poisoned. After Forell's first escape, the Russians encourage the other prisoners to beat him nearly to death. Forell only gets away a second time, on his own, through the help of a German doctor. The best bits on the run are when Forell is helped by local tribes, sometimes living with them for months. He does not really bond with them, though they even give him a dog. His most vivid companions are an untrustworthy set of ex-cons who pan for gold dust and end up trying to kill him and each other. After about Lake Baikal, the action speeds up and the author's distaste for Forell grows more apparent. The entire diversion from Kasalinsk to the border with Iran is dealt with in a few paragraphs, and after that it is clear that the hero has become an unpleasant tramp. The author's note at the beginning describes putting the book together from the stories of a man who is not altogether in his right mind, nor very pleasant. That's probably more realistic than Rawicz's peaceful old age. A long time ago I read a book about bicycling across Siberia, and liked it. 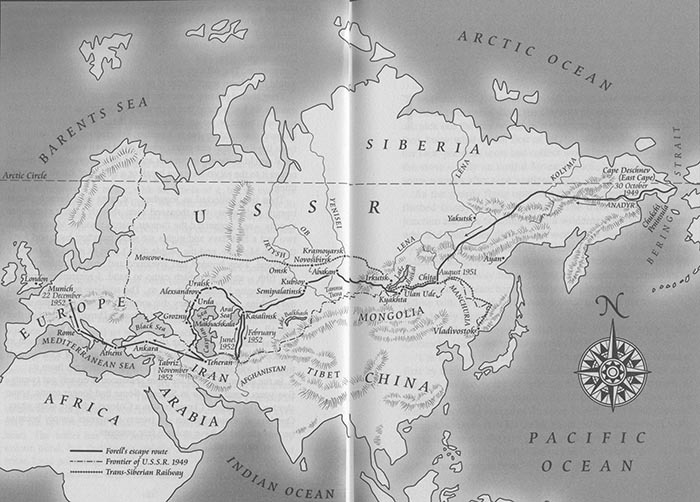 It was almost certainly Off the Map: Bicycling Across Siberia , by Mark Jenkins, because I remember the stream of consciousness style, which miraculously didn't annoy me. I also own In Siberia by Thubron, but have not read it yet. You know what I thought of Ewan McGregor's journey in the same area.